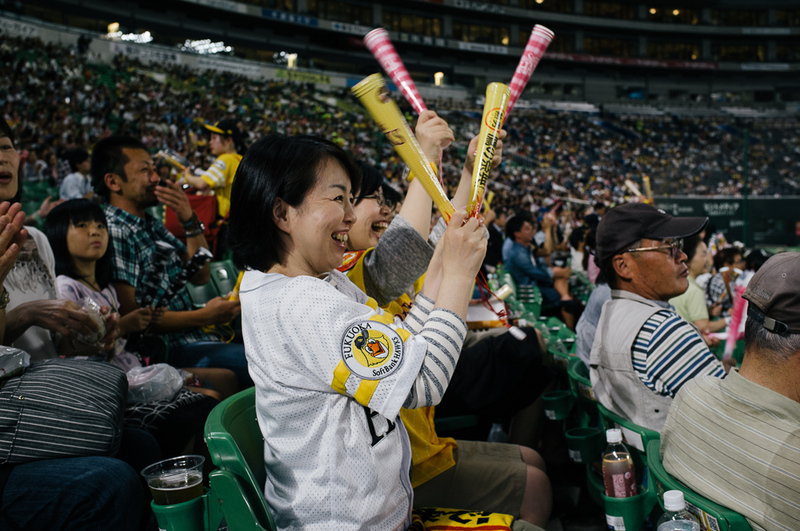 The Softbank Hawks, as you know, are the current Japanese baseball champions and as you will also know they are based in Fukuoka, where we are currently staying so rude not to go to a game really. 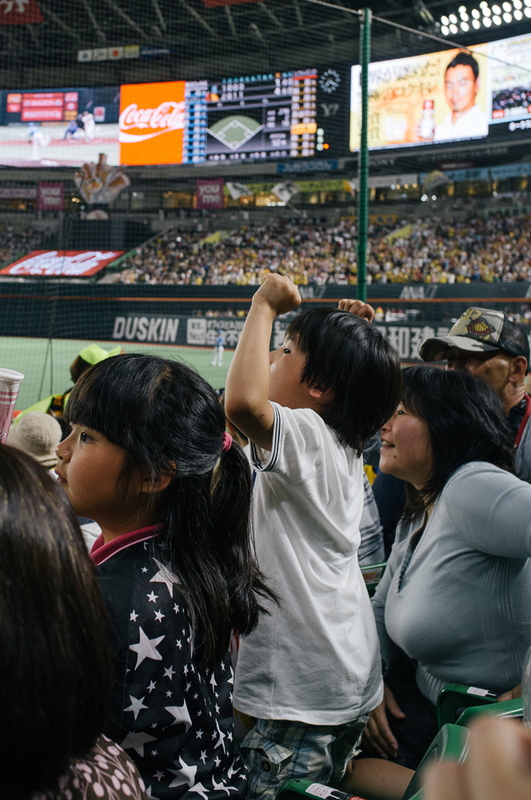 Baseball is hugely popular in Japan (I've never really been a fan but the whole spectacle and family atmosphere is great). 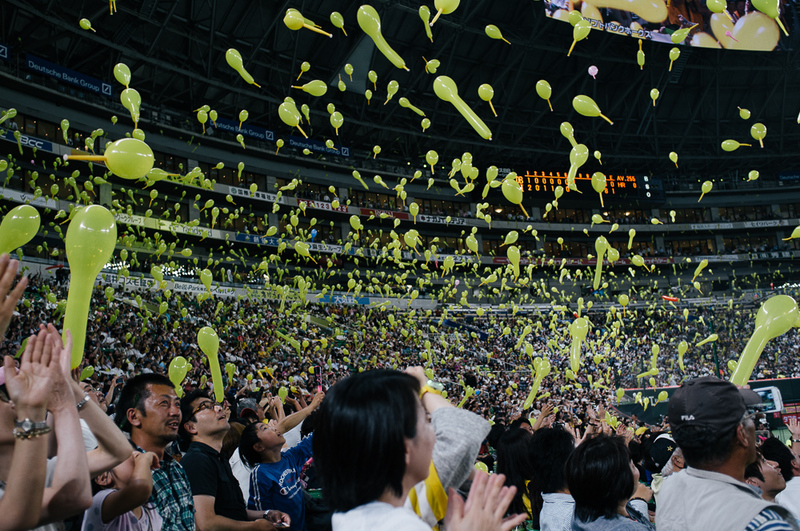 We bought tickets for the 2nd day (of 3) against the Yokohama Baystars. 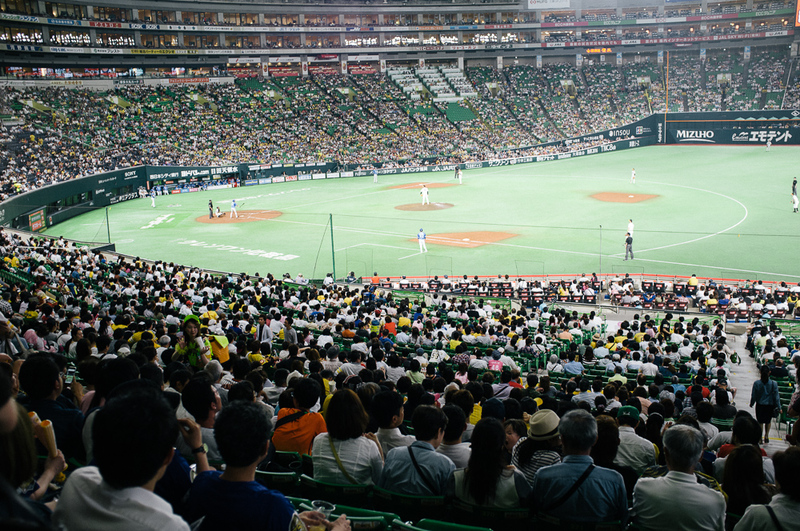 The huge stadium with retractable roof (the first in Japan) sits on reclaimed land near the beach at the edge of the city, the copper looking done shines like a beacon in the evening light as we approach with the home team's fans -the fans are all ages from old dyed in the wool Baseball fans whose skin is as worn and leathery as the Mits they have owned for 30 years or more, to small children adorned in various pieces of paraphernalia their mothers have bought from the tireless sellers who wander up and down each aisle for the whole match. Considering the match goes on for 90 hours (it seems) that is some level of fitness!. These sellers have an odd patter, a mix of waving like a child and nodding at you like you are an old acquaintance, a smile beams from their face as they emit an earsplitting caterwaul for the various goods they are selling. Each 'lap' of the aisle starts with a respectful bow before their performance starts again. As a side note: the seating is hugely confusing even the staff were fairly unsure where we had to go, eventually a kind old man (just like the apocryphal stories) lead us up and down various aisles until he found the exact spot for us...he then scurried back to his seat before we could properly thank him! 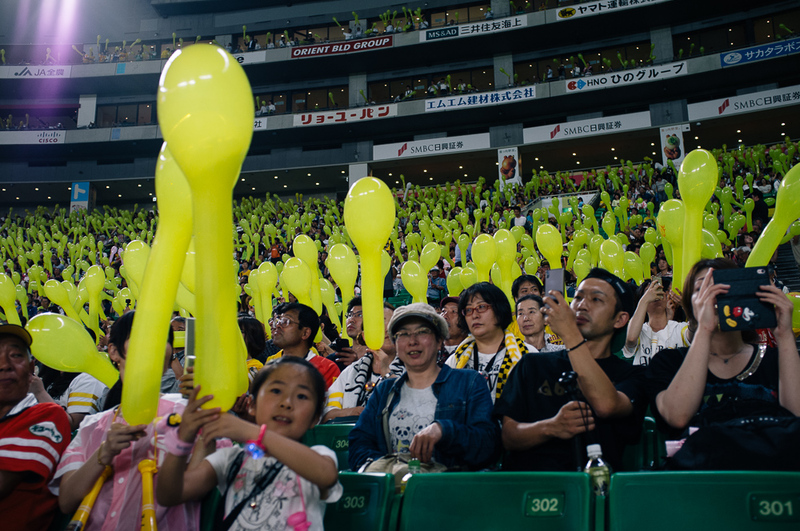 The Hawks won, yay!, the celebrations start at the 'bottom of the 7th' when everyone releases yellow (Hawks colours) balloons regardless of the result. As we were unsure quite when the bottom of the 7th actually was we blew out four balloons up a bit early and our hands were aching by the time the 'bottom of the 7th' actually arrived! Everyone quietly left the building gently chatting as they caught the subway back to their neighbourhoods, a great night out for the princely sum of £16 (+ £1.50 ish for the balloons) - you can queue up very early for a chance to get a 1000 yen ticket (about £6) making the matches very affordable for all. Right, must look up the rules for baseball and when exactly the bloody 'bottom of the 7th' is?. Strap yourself in, It's Osaka!